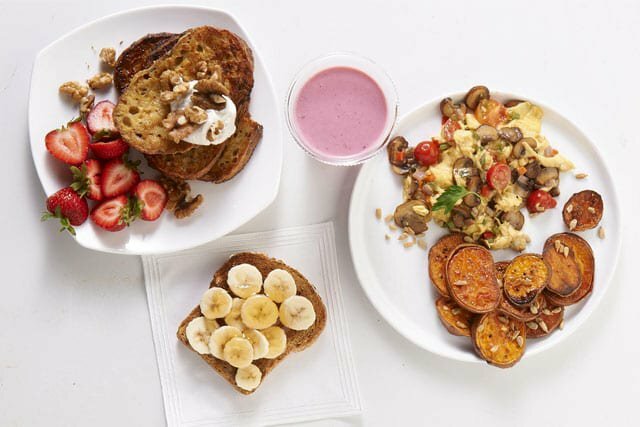 Tasty breakfast ideas to fuel your training and set you up for the day. We all know that breakfast is the most important meal of the day, but it can be tricky to squeeze a nutritional meal into the hectic period between waking up and going to work. These 10 top breakfasts are tasty, simple and designed with runners in mind. Whether you’re in need of inspiration or even if can’t face a proper meal before a run, there is something here to fuel your session and set you up for the day. Take a little time to make your own cereal and you’ll dodge the refined sugar that’s stuffed into most of those you find in supermarkets. And if you’re partial to a mid-morning muffin after a run, make them yourself using wholemeal flour – wholemeal carbohydrates release their energy much more slowly than refined carbs – and replace the sugar with fruit. Muesli is the perfect long-run fuel. Its whole grains and fruits are packed with slow-burning energy. Take a trip to a health food store to pick out the fruit, nuts and grains you like to make your own muesli mix. Bran, barley and oats are especially good wholegrain carbs so be sure to sprinkle some in your bowl. Take things to another level with homemade granola. The slow-release grains will keep you feeling full all morning, and the baked-in honey or maple syrup offer fast-release sugar, making granola an excellent breakfast option. Roll 500g of grains, nuts and seeds in two tablespoons each of honey, vegetable oil, and maple or golden syrup. Spread the mixture over baking sheets and bake at a low heat (150ºC/gas mark 2) for 15 minutes. If you fancy dried fruit, add it to the granola before baking for a further 15 minutes. A little time spent baking makes a much healthier breakfast than grabbing a sugar-packed muffin in a coffee shop. Banana bread is a great combination of fast-burning carbs for quick energy and –if you use wholemeal flour – slow-burning carbs that’ll fill you up. Line a loaf tin and preheat a medium oven (180ºC/gas mark 4). Mash 4 ripe bananas and mix with 225g self-raising flour, 100g butter, 150g caster sugar, two eggs and a pinch of salt. Bake for 1-1½ hours until the bread is golden on top and a skewer comes out clean. Fresh muffins are also a great idea. Use wholemeal flour and add some fruit for fast-burning sugar – blueberries, banana and rhubarb are all good sources of energy. It can be tough to drag yourself out of bed on a dark winter morning for a run. But having these beauties inside you – or waiting for you at home – will give you all the motivation you need. Oats are healthy, filling and 70 per cent carbohydrate – perfect for running. Stir through honey, maple syrup or fruit compote for a dose of fast-acting sugar, or add raisins or dried fruit – blueberries and cranberries are delicious. Adding sliced banana before heating makes for a sweet, healthy and heartier pre-run breakfast. With a little planning pancakes can be a quick, hot and healthy breakfast. Swap refined white flour for buckwheat to get all of the taste but far more nutrition. Make up a simple batter the night before – mix 100g flour, 300ml milk, two eggs and 1tbsp vegetable or sunflower oil – and store covered in the fridge in a large jug. Forget sprinkling refined sugar – blueberries and sliced banana are the perfect mix of sweet and healthy. After a long run in the cold, treat yourself to an indulgent breakfast that’ll top up your energy stores. This bright, tasty breakfast is packed with veggies and makes the perfect decadent weekend breakfast – before or after a long run. Sweetcorn is 86 per cent carbohydrate, low in fat and packed with vitamin C.
For 12 fritters, sift 300g self-raising flour and 1 tsp baking powder into a bowl, season and make a well in the middle. Mix two eggs, 400g sweetcorn kernels, a handful of coriander or parsley, and a generous glug of sweet chilli sauce plus the same amount of water. Put this mixture into the middle of the bowl of flour and combine (make it up the night before and leave it in the fridge). Heat a knob of butter in a frying pan and add 2-3 tbsp of the mixture. Once bubbles begin to form on top of the corn cake, flip it over and cook for a further two minutes. If you fancy a really indulgent start to the day, serve with bacon, sliced avocado and sour cream. If you’re too busy to eat a proper breakfast, it’s important not to miss out altogether. Your metabolism is at its most active at the start of the day and just after a run, so make sure you fuel it with some high-quality carbs. Whip up a stock of homemade energy bars and store in a Tupperware for a stock of quick on-the-run breakfasts that’ll fuel your running. With oats, muesli and dried fruit, you’ll get a fast-acting sweet hit without the refined sugar. Combine 175g oats with 85g muesli in a bowl. Warm 3 tbsp of honey in a small saucepan until it becomes runny, then add it to the oat mix. Stir in 150g dried fruit (raisins, dates, apricots, figs, apple, pineapple etc), two egg whites and 175ml apple juice. Press the mixture into a lightly oiled 18x28cm baking tin. Bake at 180ºC for 20-25 minutes until golden. Allow to cool slightly, then cut into bars. If you can’t eat before going running, you can at least see off the chill of cold winter mornings with a hot drink. Swap your milky cuppa for an invigorating cup of antioxidant-packed green tea (you can add a dollop of honey if it seems bitter). If you suffer from tummy troubles, this is the one for you. Green tea has also been shown to widen arteries in the heart and accelerate the body’s fat-burning mechanisms – the perfect combination for a runner. For a sugary kick that’ll see you through a session, make up a bottle of fruit squash with hot water. It may sound odd, but it’ll warm you up and the sugary carbohydrate hit will provide all the energy you’ll need to work hard. Eating properly to promote recovery after a run is essential. The first hour after a workout is crucial – during this time, your body replenishes glycogen at three times its normal rate – so try to make time for breakfast straight after a session. The best recovery meals have a 4:1 ratio of carbohydrates and protein that’ll restock your energy stores and help your muscles recover. For the perfect recovery meal, pop some protein-packed eggs onto muffins or toast. For a more decadent alternative that delivers the right mix of carbs and protein, top scrambled eggs on toast with smoked salmon, a squeeze of lemon and a dusting of pepper. Add ham and spinach instead for an iron-packed option. The recipe for a healthy and satisfying liquid breakfast is easy – just pop some fruit in the blender. Make the perfect recovery shake with a mixture of bananas – which weigh in at a whopping 93 per cent carbs – and peanut butter. Peanut butter has the right blend of protein and carbs for that magic 4:1 recovery ratio. Calcium-packed natural yoghurt also makes a substantial shake. Get inventive with what’s in season, or think ahead and stock up on summer fruits when they’re fresh and cheaper. Freeze berries and chopped fruit (they won’t lose much nutritional value) ready to tip into your blender for a little summer sunshine – and vitamin C – on a dark winter morning.